It’s not enough for teachers to read through the Next Generation Science Standards (NGSS) and correlate their content to the established curriculum. Teachers must prepare to make the vision of the NGSS come alive in their classrooms. Editor Jack Rhoton maintains that the preparation will be most effective if it begins in undergraduate coursework and is sustained by ongoing professional development designed to bring about real change. 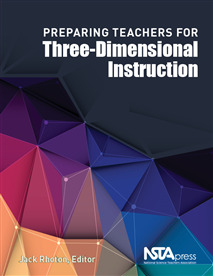 The goal of Preparing Teachers for Three-Dimensional Instruction is to contribute to that preparation—and that change. It showcases the many shifts that higher education science faculty, teacher education faculty, and others are already making to bring the standards to life. Preparing Teachers was written specifically for preservice science teachers, but science education faculty and practicing K–12 teachers can also benefit from it. The authors of the 18 chapters are outstanding classroom practitioners and science educators at all levels. Section I provides examples of teaching models that fulfill the intent of the NGSS. Section II describes approaches to professional development that can improve practice. Sections III and IV consider what can be done in both teacher preparation courses and undergraduate science courses for preservice science teachers. Section V explores ways to enlist the business community and other partners in support of the changes the standards can bring about. Rhoton calls the book “a motivating resource” for the science education community. Use it to achieve the ultimate goal of the NGSS: to move science education away from the formulaic classroom methods many students are now experiencing and instead support them in becoming true practitioners of science.